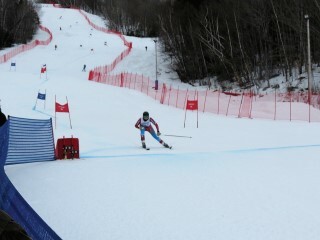 The varsity alpine ski team competed in the State Championship the last weekend of February. However, on Friday, February 23, they competed in the Giant Slalom at Mount Abram in Greenwood and Saturday, February 24, they competed in the Slalom at Black Mountain in Rumford. Although they did not place as a team, many of the student athletes had good individual results. “They all improved tremendously – not only in results but in their confidence on the slopes,” said Coach Casey Dubay. Congrats to the team for a great season!